Last week the California Air Resources Board (CARB) and California Energy Commission (CEC) released interim results from a NASA study that offers the most clear-eyed assessment yet of California’s largest individual sources of methane pollution. Methane – a potent greenhouse gas responsible for about a quarter of global warming – is emitted from several different sources, including refineries, landfills, dairy farms, and oil and gas facilities. This new study identifies 329 of the largest pollution sources and offers insights to policy makers about opportunities for reducing these emissions. Here are four key takeaways from the latest research. Previous studies in other regions have shown that when it comes to methane, a small set of high-emitting sites, known as “super emitters” tend to be responsible for a significant amount of total emissions. The new CARB study suggests the same is likely occurring in California (measurements of actual amounts of the methane will be released in the second phase of the project next year). Many times these super emitters occur randomly, such as when a major piece of equipment breaks and releases a large amount of pollution. Other times, as this study shows, these sites can be landfills, dairy farms, and refineries that simply release a lot of pollution. Although the new study didn’t find any methane releases that approach the magnitude of the Aliso Canyon gas leak, it did find that in California, just 10% of sites may be responsible for 60% of the methane released from individual sources. These findings give regulators a new opportunity to design emission-reduction programs and to evaluate how effective existing programs are at cutting pollution. 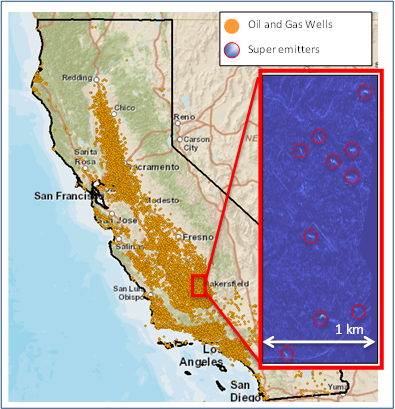 As the study demonstrates, new technology allows California policymakers to know where the major sources of methane pollution are. 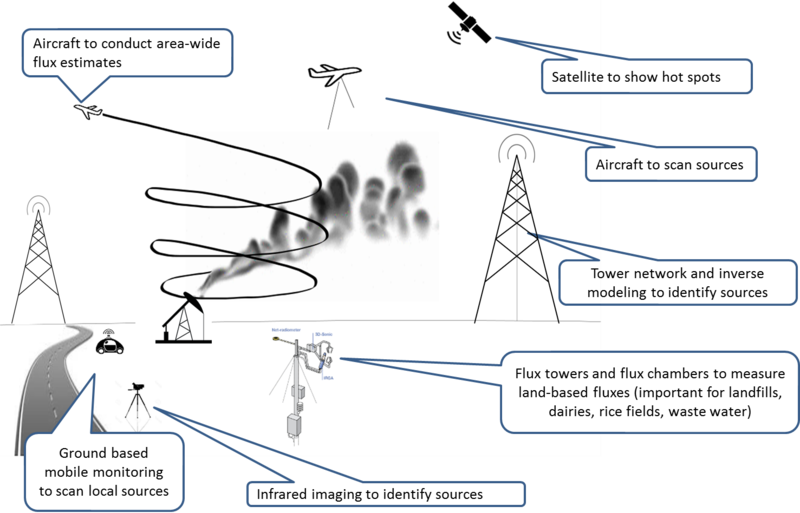 While the study used cutting edge remote-sensing technology mounted to an airplane to capture ultra-high resolution data, the results support the findings of numerous studies that show how other technology outfitted on cars and trucks, satellites, and observations made by stationary monitors, provide data that policy makers, companies and communities to act upon. California is already acting on these technical advancements. An earlier NASA study in 2014, which used satellite observations to find a large hot spot in the Central Valley, led the California legislature to pass bills like AB 1496 to identify the sources and locations of the state’s methane hot spots, and SB 1383 to develop strategies to cut the pollution. More recently, the legislature passed AB 617 that requires the development of local air quality improvement plans based in large part on advanced monitoring data. Across the U.S., the oil and gas sector is the largest industrial source of methane pollution. In California though, thanks in part to longstanding rules to curb oil and gas leaks and venting, oil and gas isn’t responsible for the majority of emissions. Rather, as the study verifies, animal waste and landfills are responsible for much of the state’s methane emissions and need to be addressed. High quality pollution data is a key part of demonstrating the link between individual sources of that pollution and impacts on local communities. For example, in September of this year, CARB stated that storage tanks and wellheads are responsible for the largest portion of oil and gas methane plumes. When coupled with a 2016 CARB study, which found a majority of leaks from oil and gas sites contain cancer causing compounds and developmental toxins, it’s clear that solutions to stop these sources must be fast-tracked in order to protect public health. Additionally, the study suggests that refineries release significant amounts of methane. The US EPA toxic release inventory emissions reports show they also emit an array of toxic air contaminants, indicating a renewed focus is needed to cut refinery pollution to protect the communities living near these facilities. Real-time pollution monitoring technology provides an opportunity to reduce emissions and protect communities. Cost-effective technology can be installed at facilities across the state – enabling companies, regulators and communities to pinpoint potential hot spots before they even start. CARB recently proposed installing these at refineries, and requires them at natural gas storage sites, but applying them to oil and gas production facilities can make a significant impact toward minimizing hot spots across California, improve air quality and protect public health. Methane hot spots may be prevalent across California now, but with the right tools, technologies and environmental protections in place, we can work collaboratively to make them a thing of the past. Both images courtesy of California Air Resources Board.